New Swedish Friend Emma, kneading the lussekatter dough. I have a new Swedish friend named Emma. I could actually call her my only Swedish friend, but that feels limiting, as if I’m only open to one Scandinavian friend in a lifetime. Ever in the pursuit of a new recipe from a faraway land, I asked New Swedish Friend Emma (NSFE) if we could bake a “super traditional Swedish Christmas something.” Thankfully, NSFE also loves to bake. Not only was game to join me in the kitchen, but she was also patient enough to translate recipes from Swedish to English and convert deciliters to cups all while being peppered with questions about all things Christmas in the land of pickled herring. Our judodis of choice, the classic toffee (klassick knack). For the recipe, click here (you might have to click "translate" in the toolbar). As it turns out, the category of “super traditional Swedish Christmas something” is plentiful. There are countless candies (judodis), gingerbreads (pepparkakor), and just straight up "Christmas food" (julmat) from which to choose. The bounty is born out of Swedes baking and partying hard throughout December - a way to survive the cold, dark month. So Sweden in December is all about food, mulled wine, and lots and lots of candlelight. Oppressive chill and a lack of sunlight aside, it sounds pretty nice. One of the Christmas season occasions that captures all of the above is St. Lucia Day. It’s celebrated on December 13, and is marked with children dressing up in long white robes with red sashes, representing St. Lucia, elves and stars. The St. Lucia wears a crown of candles on her head, and all sorts of traditional songs are sung as kids parade through neighborhoods, schools, and church services. The traditional food of St. Lucia is lussekatter, a reverse-S coiled, saffron-yellow bread roll that is dotted with raisins. Traipsing the fine line between sweet and savory, these little buns can be enjoyed at any time of day. 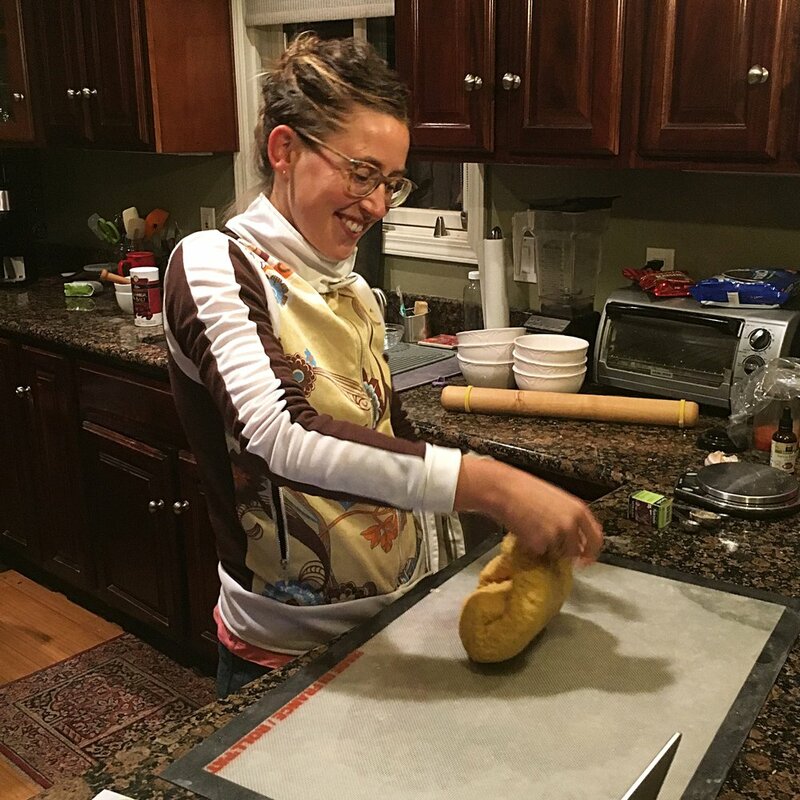 While they are definitely made for and eaten on St. Lucia day, Emma assures me that part of the tradition is to make a ton of rolls, freeze them, and eat them throughout December. So what is the story behind St. Lucia and her golden-hued, curly-cued buns? Here is where two legends collide, and honestly, neither are pretty. Let’s start with the one that puts Lucia as Adam’s first wife. If you thought Eve was bad with her garden dalliances, Lucia actually slept with the devil and spawned nasty little devil babies. The “S” shape in this case represents the devil’s curled up cat (because Satan had pets?) and the yellow from the saffron is meant to ward off evil. In this case, Lucia’s name doesn’t mean “light” but draws from the Luc- in Lucifer. The only parts of this story that seem to hold with current Swedish tradition is a vague reference to animals becoming possessed and able to speak. Not exactly a charming origin for an otherwise fun kick off to the holiday season. St. Lucia's eyes, or the devil's cats? No matter what you choose to see, they are delicious. Click here for the recipe. Again, it might show up in Swedish, so just click "translate" when Google offers. Next up is the martyr story. This version holds that in the third century, St. Lucia was a Christian girl who would secretly bring food to persecuted Christians in Rome (being a Christian was illegal then). She would wear candles on her head to light her way, keeping her hands free to carry food. This sweet St. Lucia was engaged to a Pagan, but the only problem is that she did not want to marry a Pagan, and so gave her dowry to the poor. Her fiancée turned around and reported her to the authorities for being a Christian. For some reason, while in prison, St. Lucia either gouged out her own eyes, or got them gouged out by her captors. Subsequently, she was burned at the stake, but since she was so holy and good, that didn’t work. The Pagan captors then cut her throat which finished the job. St. Lucia, whose name means “light”, was then canonized and became the patron saint of the blind. In Italy the “S” shape of the rolls is said to be St. Lucia’s eyes, but it doesn’t seem that Sweden holds tightly to that reference. Martyrdom and devil felines aside, I think Sweden is onto something, turning all of December into a month long food fest. We might have sunshine and our nighttime temperatures might not dip below 50℉ (Emma, that’s 10℃ celsius) but they know how to party - St. Lucia buns and all.